The story begins in 2005 on a 12 acre farmlet on the outskirts of Christchurch New Zealand where Janette Eason-Savage, took up breeding llamas and black sheep. What started out as a hobby quickly gathered momentum, as Janette grew her herd numbers. Her farming background and ability to acquire new knowledge proving invaluable when it came to picking the best breeding stock, capable of reaping the best quality fleece. The herd quickly reaching an economic level and export quality, resulting in the founding of Briar Patch New Zealand Ltd in 2006. After the Christchurch earthquakes damaged Janette's home in 2010 and destroyed Briar Patch's office in the central city in 2011, the farmlet was sold. This signalled the beginning of the next stage in the Briar Patch story, when Janette packed-up her Llamas and black sheep and moved to Te Toko Station near Waitomo Caves, Waikato in the North Island. Over the last few years, the Briar Patch product range has been extended to include the yarn from other farmers involved in sustainably farming and promoting the unique qualities of wool. Collectively, the industry has rallied to create the globally promoted ‘Campaign for Wool’, which all those involved in the Briar Patch business passionately support. The ‘Campaign for Wool’, is a global campaign started by HRH The Prince of Wales to educate and increase awareness of the unique attributes of wool and its versality in everyday life. For some very good reasons to choose wool see our Learn More Page. It’s important to us, that you know the exact source of your knitting yarn and, have the opportunity to look beyond the wool product. We facilitate that all important connection, between knitter and farmer. This is a unique approach in a world where the consumer knows little, if anything, about the origins of what they buy much less, the people who actually produce it. Briar Patch is proud to be able to create that opportunity through this website which is clearly, more than just a place to buy your knitting yarn. Every farming family involved with producing wool for Briar Patch New Zealand, can cite generations of sustainable farming practices. By marketing the wool directly to you, we hope to provide exactly what you want in a knitting yarn. You also have full confidence, that what you’re buying comes from an environmentally sustainable source. Janette has spent most of her life living or working around farms and farm life. She was brought up on a Romney sheep farm in South Otago - her late father was a farmer all his life. Her late mother was a nurse and midwife from Colchester, England who emigrated to New Zealand in 1952. Janette is a qualified accountant and a member of both the New Zealand Institute of Chartered Accountants and the New Zealand Institute of Directors. In 2006, she was working full time as the New Zealand accountant for H Dawson & Sons Co NZ Ltd - the New Zealand branch of the English Wool Exporting company. After many years working as a management accountant in Wellington-based corporate organisations, she returned to her farming roots. Janette purchased Briar Patch in 2005, a 12 acre property near Christchurch in the South Island. She subsequently focused on learning the wool and yarn processing trade and growing her herd of Llamas and black sheep. Briar Patch was founded in 2006. For the next couple of years, she supported her quest for wool knowledge by undertaking various accounting and strategy contracts for a range of ultra fine merino wool growers with their own businesses. In 2009 while visiting a small alpaca fibre processing mill near Waitomo Caves in the North Island, she met Kim Osborne from Te Toko Station. A little over a year later, and after the Christchurch earthquake devastated the Briar Patch office in the city centre and damaged her house, he persuaded her to pack-up the Llamas and sheep and move to Te Toko Station to live with him. In June 2013 they were married in at Woodlyn Park in Waitomo - and of course wool featured in the wedding. 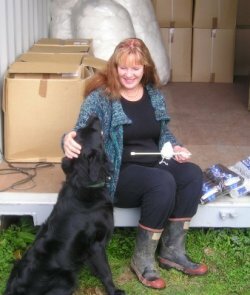 Janette is very passionate about wool, knitting and spinning and would like to see some of New Zealand's great wool shared with knitters and spinners around the world.